About the Children's Department: Begin 2015 with a Few Questions and a Prayer! Begin 2015 with a Few Questions and a Prayer! Today is the first day of 2015. As you think about the end of 2014 ask yourself the following questions . . .
What did I try in 2014 which engaged children and families? What did I try in 2014 which did not work as I hoped? 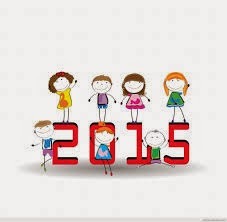 What might I do in 2015 to engage children and families? What did I do in 2014 to reach unreached children and families in my community? What might I do in 2015 to reach unreached children and families in my community? How did I encourage and support my volunteers in 2014? What can I do in 2015 to encourage and support my volunteers? How did I train my volunteers in 2014? What can I do to train my volunteers in 2015? How did I grow closer in my walk with Jesus in 2014? What can I do to grow closer in my walk with Jesus in 2015? These are just a few questions to get you thinking, but today is an excellent time to stop and evaluate what you have been doing, what you could do in 2015 and to get on paper some specific steps you will take to accomplish the things you'd like to do in 2015. It is also the exact moment for you to put behind you any areas where things didn't go as you hoped, mistakes you made and to trust in God's grace to move forward. We all make mistakes, we all need Gods grace. If there is anyone who you need to ask for forgiveness from; do so right now. Begin 2015 with a "clean slate"! Prayer – Dear God I pray today You will help me depend on You. Please help me count on You from morning to night and know I can put myself in Your merciful hands! Please help me know with confidence You pay attention to my prayers and listen to my cries for help. Please give me the confidence You will answer! Please help me rejoice in the truth there is no one like You and nothing compares with Your works! Train me to walk straight so I will follow Your true path. Please help me know I can trust You to put me together, one heart and mind so, undivided, I will worship You in joyful fear! Thank You for Your great love! Thank You for snatching me from the brink of disaster! Please help me rejoice in knowing You are tender, kind and not easily angered! Please help me experience Your immense love today so I will never, never quit! Please look me in the eye and show me kindness; give Your servant the strength to go on and the peace of knowing You will save me because I am Your dear, dear child. Please help me see today how You make a show of how much You love me and please help me draw strength from knowing You are gently and powerfully putting me back on my feet. Thank You. Amen.